It's always breakfast, no matter the dish, no matter the time of day. When I'm eating breakfast, it makes me feel like something new is about to begin or like something was worth staying up for, and someone, staying up with. 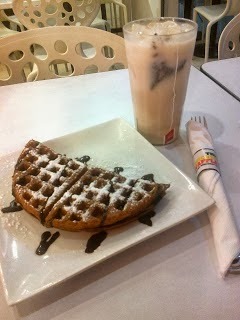 This is my spicy chai latte and hazelnut waffle sandwich from The Wicked Waffle All-Day Breakfast Cafe in Eastwood Cybermall. Breakfast was at 1am, with a book, The Girl who Played with Fire.